It’s Finally Friday! This means another round of cattle breed facts; a series of Cattle Breeds 101 posts where I cover different breeds beef cattle. Facts will be shared from American Breed Associations and the Oklahoma State Cattle Breed Database. Today, American White Parks are promoted and selected as a beef breed. The breed’s origin, however, is not clear. Some think it is largely descended from the British White, a hornless, dual purpose breed from the eastern countries of England. Others feel that the American White Park is primarily Angus in origin with some White Park breeding introduced from the breeding pairs of White Park brought in during World War II to Canada. According to this theory the offspring of the original importation were sent to the Bronx Zoo, from there they were split into two groups. One was sent to the King Ranch in Texas and formed the nucleus herd of the White Park in the United States. The second groups was sent to Washington and played a part in the formation of the American White Park. Regardless of the origin of the breed the American White Park should not be confused with the ancient White Park of Britain. In genetic marker tests, the White Park has been found to be a very distinct breed from either the American White Park or the British White breed so any contribution they may have made to these breeds has been greatly diluted by the introduction of other breeds. The breed association was formed in 1975. It maintained an open herd book policy for six months during which time 300-400 animals of varying documentation but the correct appearance were included. Since that time, a number of purebred British White bulls have been imported into the U.S. and introduced into American bloodlines. 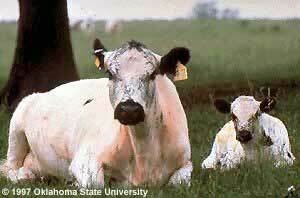 The American White Park is comparable in size to the Hereford, Angus, and Shorthorn cattle. Have a cattle breed you would like to learn more about? Send me an email (agricultureproud@hotmail.com). Appropriate topic, as today at the Keystone International Livestock Expo in Harrisburg, PA the National Show for this breed is going on. We started with one White Park. No matter which bull she bred to (Hereford, Maine, or Angus) she had a calf that looked exactly like her. Great milker, raises the largest calf every year.